Disney’s smash hit musical The Lion King is a spectacular visual feast, which transports The Lion King Theatre Breaks audiences to a dazzling world exploding with glorious colours, stunning effects and enchanting music. 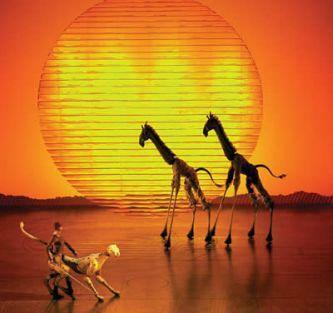 You will never forget the theatrical event that is Disney’s internationally celebrated musical The Lion King. Experience for yourself this ‘astonishing triumph of theatrical imagination‘ with ticket and hotel packages from just £107pp. Welcome to the Award-Winning musical set against the majesty of the Serengeti Plains and to the evocative rhythms of Africa. At heart is the powerful and moving story of Simba – the epic adventure of his journey from wide-eyed cub to his destined role as King of the Pridelands. Simba, Prince of Lions, enjoys his life as the heir apparent of the pridelands. When his evil uncle Scar kills his father and takes the queen as his wife things change. Scar tries to encourage Simba to his death, by making a pact with some hyenas. But the young lion manages to escape and is rescued by Timon and Pumbaa, a meercat and warthog who teach Simba their No Worries philosophy. Disney’s The Lion King is a perfect highlight for a theatre break. Whether it is a romantic break for two or a half-term break for the family. The Lion King is a fantastic show. I and my husband have seen it in London 5 times and would definitely go again. Every member of the audience in the theatre felt like they were part of the Lion King, from the actors in the aisles to the familiar and well known story it encapsulates. Great from start to finish, no matter what age. The performances are great, the singing is first class, the dance routines are spectacular and there is a great African feel about the whole show. The scenery is impressive the myriad costumes are inventive and colourful and combine with the great puppetry. The whole show is beautifully lit with vibrant colour and subtle effects. I loved the way the whole space was at times filled with flying birds or clouds or jungle vegetation. A total feast for the eyes. Timon and Pumbaa add wonderful comic relief and it all adds up to excellent family entertainment. My 11 year old son thought that the whole thing was brilliant. It is easy to see why it is still packing the theatre after 15 years.